SEATTLE–A third-quarter safety helped the Seattle Seahawks take control of a game they led, 22-10, after three quarters of play at CenturyLink Field on Thursday night. The Seahawks opened the second half with Marshawn Lynch gaining 23 yards on two carries. On third-and-10, Sam Shields made a saving tackle on Doug Baldwin and the Packers defense forced a punt. Randall Cobb made a fair catch at the Packers 14. Aaron Rodgers’ first pass of the second half glanced off the hands of Jordy Nelson and into the hands of Seattle cornerback Byron Maxwell, who returned the interception to the Packers 8-yard line. To the credit of the Packers defense, thanks in part to a Nick Perry deflection of a Russell Wilson pass, the Seahawks were held to a field goal, 20-10, with 10:28 to play in the third quarter. The Packers avoided a three-and-out when Rodgers hit Nelson for a first down. Again, Rodgers faced third-and-long. This time, Rodgers found Cobb over the middle for 23 yards to the Seattle 46. On third-and-5, Rodgers scrambled from pressure and threw incomplete deep for Nelson. Mike McCarthy decided to go for the first down on fourth-and-5 and Rodgers was sacked. From midfield, Harvin ran the jet sweep for 16 yards. The Packers defense stiffened, however, and forced a punt. Cobb made a fair catch at 10. On the next play, Rodgers was sacked by Michael Bennett and stripped of the ball. Derek Sherrod recovered in the end zone but the Seahawks had scored a safety, taken a 22-10 lead and obviously control of the game. An unsportsmanlike penalty on David Bakhtiari worened the situation and left the Seahawks to start their next possession at their 47-yard line. Seattle began to pound out first downs in a time-consuming drive. They were at the Packers 3, first-and-goal, when the quarter ended. SEATTLE — The Packers defense had a rough second quarter, allowing the Seahawks back-to-back touchdown drives as Seattle took a 17-10 lead into halftime on Thursday at CenturyLink Field. The Seahawks quickly erased their early deficit, driving 80 yards in six plays to take the lead. The last two plays covered 66 yards with a pair of 33-yard passes. On the first, LB A.J. Hawk and S Morgan Burnett ran into each other in coverage, leaving WR Percy Harvin wide open for a big gain. Then, on a 33-yard TD pass, CB Sam Shields bit hard on a read-option run fake, which left WR Ricardo Lockette wide open. S Ha Ha Clinton-Dix then missed the tackle in the open field, and Lockette scored. The Packers came right back to tie the score, driving 80 yards but settling for a 23-yard FG by K Mason Crosby. An 11-yard slant pass to WR Randall Cobb and a 6-yard run on a draw by RB James Starks converted a pair of third downs. On the next third down, Seahawks LB Bobby Wagner dragged Cobb down on a deep ball for pass interference, a 44-yard penalty that gave the Packers first-and-goal on the 7. But it stalled there, and the Packers could only tie it at 10 with 6:52 left in the half. The Seahawks wasted no time re-taking the lead again, driving 70 yards, with RB Marshawn Lynch capping it with a 9-yard TD run for a 17-10 lead. TE Zach Miller made a diving, one-handed 24-yard catch to start the drive and Lynch added a 21-yard run to get the Seahawks into scoring position. The Packers failed to counter, as QB Aaron Rodgers’ third-down pass for an open WR Jordy Nelson along the sideline in Seattle territory was too high, forcing a punt with just over a minute left. SEATTLE–The Packers held a 7-3 lead over the Seattle Seahawks at the end of the first quarter of Thursday’s season opener. The Seahawks won the coin toss and deferred their choice to the second half. The Packers received the opening kickoff and managed a short return to their 13-yard line. That’s where the 2014 season began for the Packers. Immediately in their no-huddle offense, the Packers gained a first down on a 6-yard run by Eddie Lacy followed by a Seahawks offside penalty. On the next play, Lacy bounced off a defender and ran for 15 yards. That’s where the drive ended. A short punt left the Seahawks to begin their first possession of the season at their 35-yard line. Three plays gained a first down near midfield. On third-and-2, Russell Wilson threw high and the pass was deflected and nearly intercepted. Wilson could easily have run for a first down. The Packers extended the Seahawks drive, however, when Mike Daniels was flagged for running into the punter. A jet-sweep run by Percy Harvin gained 13 to the Packers 26. On third-and-5, Wilson threw short of the sticks, leaving third-and-1 and bringing on kicker Steven Hauschka to attempt a 35-yard field goal. Hauschka was good and the Seahawks led, 3-0, with 6:03 to play in the first quarter. The Packers began their next drive at their 20, and the noise began to build at CenturyLink Field. Rodgers threw to Jordy Nelson for 11 yards and a first down. On third-and-14, Rodgers was unable to find an open receiver and the Packers were forced to punt again, but this time it was the Seahawks that committed the special teams error. Earl Thomas fumbled the punt and the Packers recovered at the Seahawks’ 34. Ha Ha Clinton-Dix recovered the fumble. 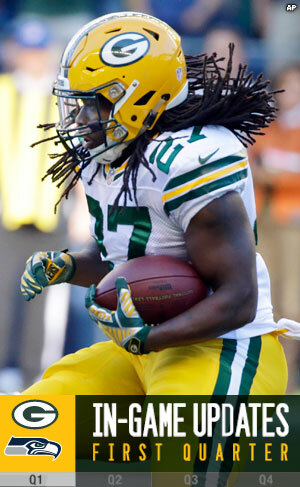 Two runs by Lacy left third-and-8, and then Rodgers threw to Randall Cobb for 8 yards and a first down. Rodgers found Nelson for 16 yards at the Seahawks 8. Another pass to Nelson left the Packers at the 2. From there, John Kuhn scored in a formation that included Daniels in the backfield as a blocker. The Packers led, 7-3, with 1:25 to play in the first quarter.